NEW DELHI: The BJP's vote share in Gujarat has slumped sharply since the 2014 Lok Sabha polls when it clocked nearly 60 per cent votes, while that of Congress has improved significantly -- still not good enough for the Rahul Gandhi-led party to win sufficient number of seats. As per the results declared today by the Election Commission, the BJP has got close to 49.1 per cent votes, down from nearly 60 per cent in 2014 but somewhat higher than nearly 48 per cent it polled in the 2012 state assembly polls. On the other hand, Congress' vote share has risen to about 41.4 per cent this time -- up from 33 per cent in the 2014 Lok Sabha elections and also higher than around 39 per cent in the 2012 assembly polls. The difference in vote share between the two parties works out to be around 7.7 per cent, in line with a shrinking gap witnessed since the 2007 assembly polls in the western state. In 2007, the BJP's vote share was 49.12 per cent as against 39.63 per cent of the Congress, the gap being 9.49 per cent. This gap further reduced to 9 per cent in 2012. 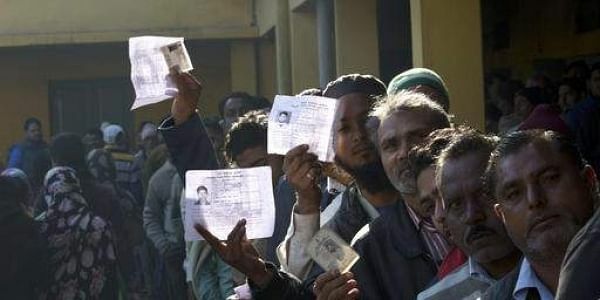 The gap was much wider at 10.4 per cent in the assembly polls held immediately after the 2002 riots, which is said to have sharply polarised the electorate. The difference in vote share was nearly 30 per cent in 2014, the year BJP stormed to power at the Centre riding a pan-India Narendra Modi wave and had won all seats from Gujarat. After a complete rout in 2014, the Congress has improved its performance while its seat tally has also improved from the 2012 levels. As per the results declared today, the independents have scored 4.3 per cent votes in Gujarat, while 1.8 per cent voters opted for NOTA (None of the above). No party other than Congress and the BJP could get even 1 per cent votes.